I have always liked the idea of “monsters within” – how every single one of us has something dark and mysterious hidden inside like a Quentin Tarantino movie character. But oh, I did not expect my fantasy to materialise in the form of a brain-eating monster. Zombies have taken over the streets of Bahrain! You see them wandering down the streets, heads bowed as if in prayer, making an occasional grunting noise. Of all the things in the world, late night walks and drives were what I enjoyed most. There’s nothing like the feeling of the wind blowing my pixie cut while admiring the beautiful dusks and skylines of this little island. Tall light poles leading the way, the moon shining through the clouds and the palm trees forming dense silhouettes that fade into distance – the city looks beautiful at night. You’ve read “enjoyed” correctly… emphasis on the past tense. I can’t seem to appreciate those activities anymore without fearing that I’d get myself into an accident. People are so oblivious nowadays – everyone has become so fixated on their phones that nobody wants to put it down even when crossing the street, getting through sidewalks and driving! When you do these activities while slouching to meet your mobile, you are essentially acting like a zombie. A distracted walker drifting the city’s sidewalks seemingly unaware of everything except the latest notification on their phone. I too, am hardly innocent. My phone bears scars that looked like I got into a brawl – actually, I walked into a wall while scrolling through Facebook. Close your eyes and count five seconds… Open them. That’s the average amount of time people take their eyes off the road while using their mobile devices when driving. In just one of those seconds, catastrophe can strike. In a matter of seconds, you could ruin lives forever. 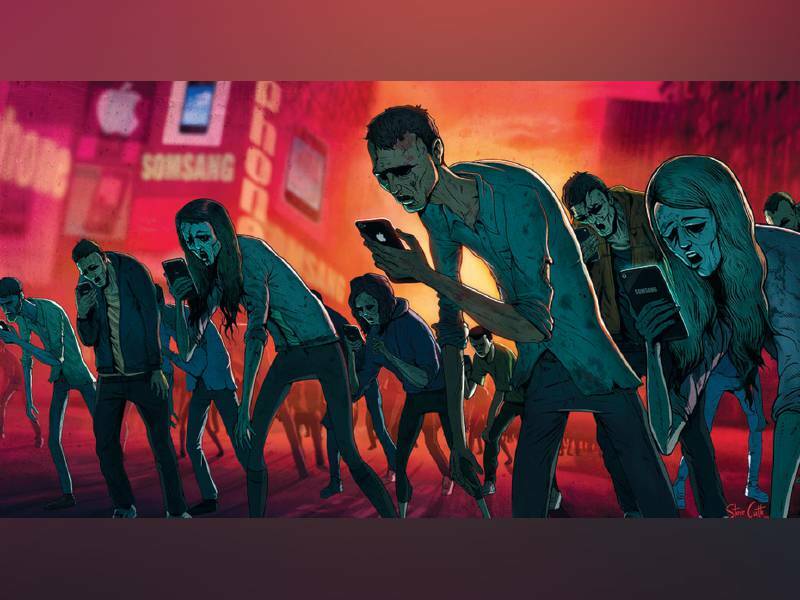 “Smombies” or zombies on smartphones are walking into accidents. These individuals are on their way to a literal “crash course”, as if the lack of countdown timers on the signals wasn’t enough. According to Marshall McLuhan from the never-ending communication classes at the university, “we shape our tools and thereafter our tools shape us”. Thanks, Marshall, I think we’ve finally got the message now. Even the strong-willed are susceptible to a buzzing gadget but one could at least try to be more responsible and aware (in the real world).